Since 1998 Gallatin River Guest Cabin inspiration has been centered in Big Sky on the beautiful Gallatin River. Turn into the driveway at mile marker 48 and park your rig. Follow the lighted stone walkway about 200 feet towards the river and mature pine trees and you will see our charming guest home built with the biggest logs you have ever seen. As you open the door to the lighted cabin, music is softly playing. The king bedroom has a Native American Decor and main floor bath. The kitchen is fully stocked with condiments, breakfast supplies, cooking utensils, dishes and the smell of fresh whole bean coffee. The log bar is huge and makes the dining area seem small. Views of the mountains and river are breathtaking. You are delighted with the living room fly fishing decor and a fireplace. The glass patio door draws you to the deck with a hot tub that will relax you as you see the moose, deer, or eagle go by. The log staircase invites you to the second floor bedroom and bath with washer and dryer. There is also a family room loft with satellite TV surrounded in western decor. We are just 8 miles from Big Sky Ski Resort, where there is great snow and no lift lines. You can fish, hike, golf, whitewater raft, ride horses, hunt, cross country ski the backcountry, around the golf course. You can also snowmobile, take in a lecture about the area, visit West Yellowstone and Yellowstone National Park just 40 minutes away, climb any mountain, or watch the sunset, but do not feed the bears. Eat at some of the finest dining areas up the mountain or down the canyon or ride the free shuttle to a cowboy bar and dance the night away. Call to book your winter, summer, spring or fall vacation of a lifetime, but be careful! You may fall in love like never before. If you do, the Soldiers Chapel is just down the road! Check our website at http://www.gomontana.com/grloghomes. 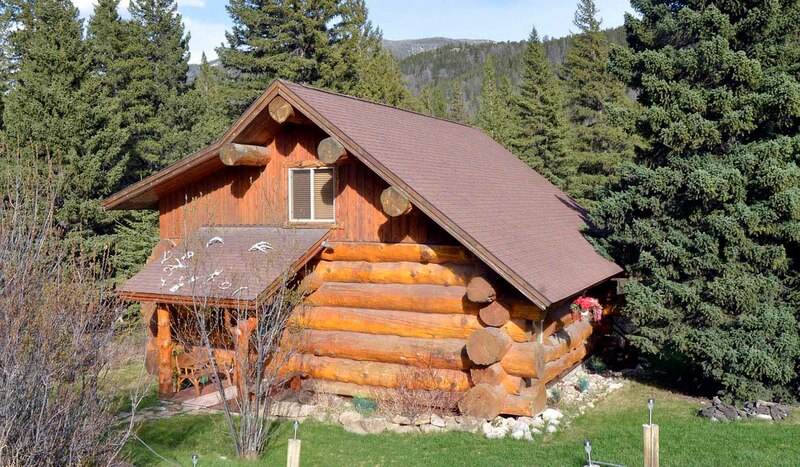 Click on Magnificent Log Cabin.